I’ve been watching my waistline and trying to get fit lately and it made me reflect on my parakeet’s weight. Similar to humans, there is a target range for budgie weight that relates to optimal health. This range is about 1.1 to 1.4 ounces (or 25 to 36 grams). It may seem sort of impossible to weigh a flying target that amounts to less than a package of 2 Reese’s peanut butter cups, but it’s actually pretty easy. Some folks get an official Bird Scale , which comes with a perch and should be very simple for a large parrot to use, but for a small parrot like a budgie, I have found it’s easy enough to use a basic Food Scale (and some Spray Millet ). Toby is very happy to do a photo shoot on the scale for treats, you can see that the scale shows she appears to be at the upper limit of healthy weights, but I didn’t weigh her at the best time of day so it was a bit elevated. For the most accurate weight reading you will want to weigh your parakeet after their first morning poop but before they have had breakfast. It’s quite common for budgies to become obese, particularly if they are sedentary and stay at home in their cage most of the time. Also a lot of commercially available seed mixes are high in fats and it can be extremely difficult to get parakeets to eat healthy (just like people!). 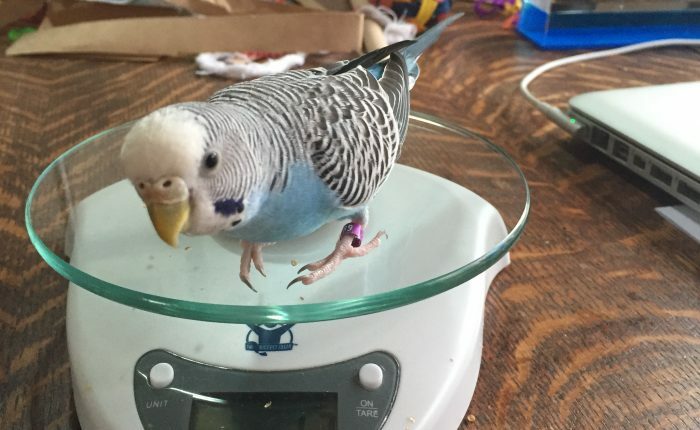 This is another reason I would advocate strongly for allowing your budgies to be flighted; this will really help them get the exercise they need to maintain a healthy weight. If you choose not to have flighted budgies then please make sure yours have the largest cage possible/lots of toys to play with and when outside of the cage you encourage them in physical play. Either way your budgie should have the biggest cage you can manage and a suitable number of toys and perches. So – what are the health risks associated with obese budgies? The big one is liver disease/fatty liver. Liver disease occurs because birds store excess fat in their livers, and over time an obese bird’s liver tissue is replaced with fat, compromising the liver function. The symptoms of liver disease could be difficult to detect at first or confused with other diseases, they include (but are not limited to) loss of appetite, breathing difficulty, diarrhea, depression, distended abdomen and lethargy. The best way to avoid fatty liver disease is to help your budgie maintain a healthy weight and an active lifestyle, and offer a diet that includes a good quality seed mix (like Dr. Harvey’s Parakeet Blend Natural Food for Parakeets ) and depending on your preference, pellets (Roudybush Nibles ) as well as vegetables and fruits. As long as you are keeping an eye on your parakeet’s weight and offering a good diet and lots of opportunities for exercise your parakeet should be able to easily avoid the perils of putting on a few ounces. 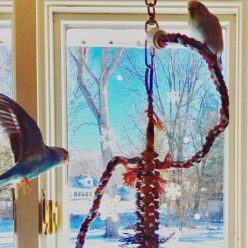 Additionally, thinking of the holiday season, it may be particularly tempting to feed your parakeet some human treats, or even things like crackers, cereal etc, but they don’t need it and it’s not good for them. Since it should be pretty easy to avoid I recommend not feeding any “human” food at all outside of veggies and fruits. Previous Previous post: Merry Christmas from our flock to yours!